The Grazor™ is available at Billy Goat Paving Dealers only. The Grazor is invaluable for the sealing contractor who has to remove vegetation and other debris from cracks and crevices before laying down crack filler and applying sealant. 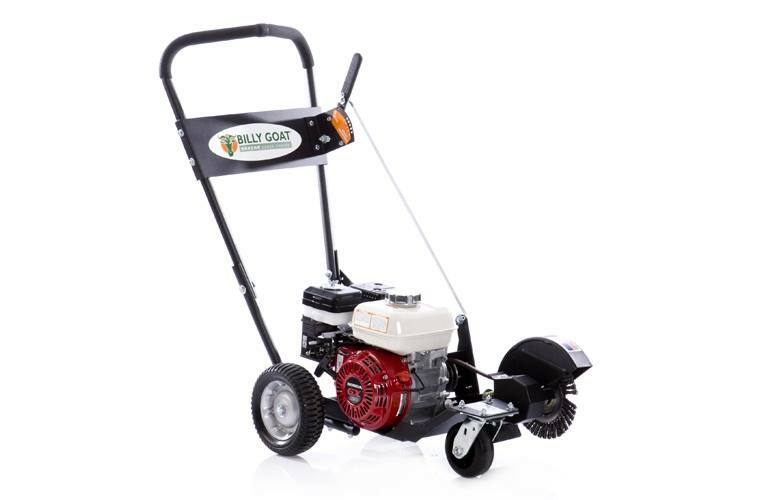 Unlike cheap lawn edgers that weren't designed for this application, the Grazor's robust construction and balanced platform make cleaning cracks much less of a chore. The pulley ratio is optimized for maximum cutting torque without belt slippage or premature sheave wear. Engineered for the demands of the pavement industry, the Grazor rips through ragged cracks and crevices at the rate of five feet every 15 seconds. Heavy-Duty Swivel Caster: 360 degree of rotation and bolted on all four corners for added strength. Includes zerk lubrication. Wide, Stable Wheel Base: Heavy-duty 8" semi-pneumatic tires improve stability and maneuverability on any hard surface. Remote Brush Declutch: Allows smooth transfer of power to the brush for the ultimate in control and safety.